These are perfect little bites of goodness that the kids will love! They’re great served with rice or noodles or as a fun finger food on toothpicks or skewers. The curry flavor is mild enough for even the fussiest little eaters but are also great for the grown-ups! To save time, make them ahead of time and store in the fridge for up to 1 day. Mix the ground chicken with the onion, all dried seasonings (except curry), garlic, eggs, and breadcrumbs. Shape into bite sized meatballs. In a large skillet brown the meatballs on all sides in oil and then transfer to a baking dish. In a sauce pan melt the butter and then add the flour and curry powder. Cook for 2 minutes on low heat and then add the stock and sour cream and simmer for 5 minutes. 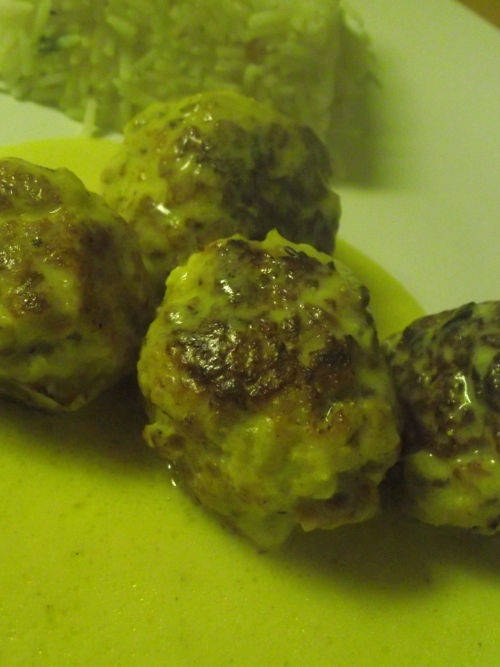 Pour curry sauce over meatballs and baked covered for 45 minutes at 350.